Height adjustable legs with a variety of valance height options from 68" to 77". The Shelter Logic 10 x 15 White Pop-up Canopy Tent with a Truss Ceiling - Pro Series give safe sturdy shelter for a fraction of the cost of a commercial, walled, hard to set up structure. 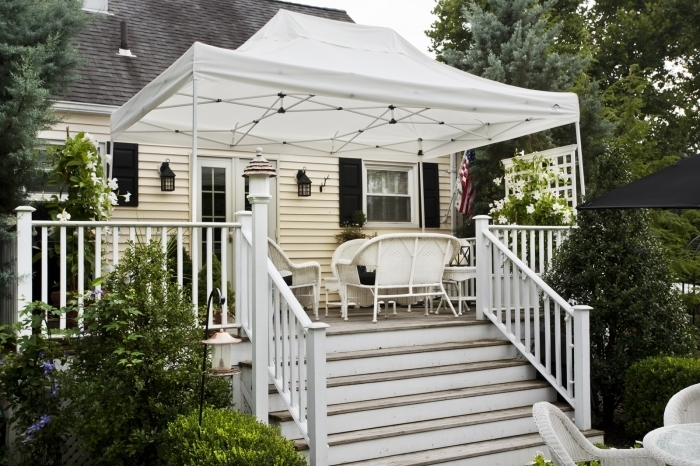 You get most of the features of large, expensive canopies for a lighter weight, affordable canopy. The Shelter Logic 10 x 15 White Pop-up Canopy Tent with a Truss Ceiling - Pro Series has a tubular welded steel frame for plenty of support. The from fold up for easy installation. The tent comes with a wheeled storage bag for easy transport and storage. 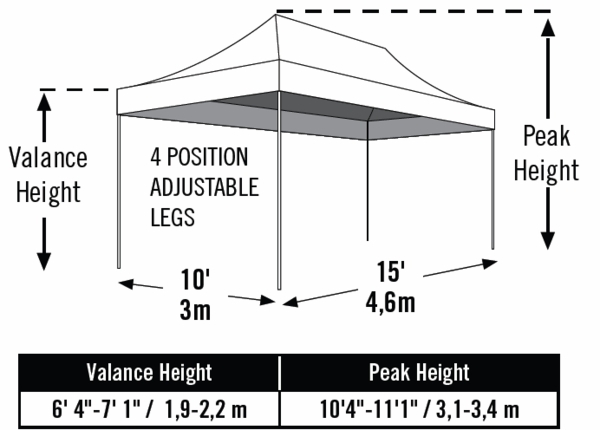 What size is the tubing of the legs of this ShelterLogic 10x15 white pop-up canopy? Can you add company logos to this canopy? 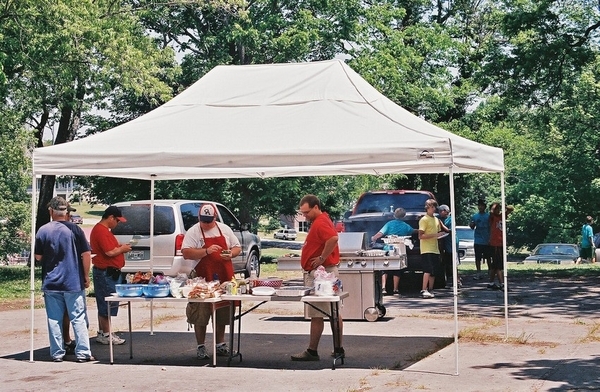 Unfortunately, we do not print on our ShelterLogic canopies. For a quote for a 10' x 15' pop-up canopy with your logo(s), please fill out our canopy custom graphics free quote request form. Can you cook under this tent? Does it meet fire ratings if I wanted to cook under it? This item is not designed to be used as a cooking station. A tent must have either a CPAI-84 or NFPA-701 fire certification to be used in this way. The lowest cost 10 x 15 tent we offer with these certifications is the Caravan Classic 10' X 15' Canopy with Professional Top - 51509. Are side panels available for this ShelterLogic Canopy? Unfortunately, no, there are not sidewalls available for this model. We apologize for this inconvenience. The material listed for this shade tent is polyester. Is it more of a silky material or more similar in feel to a canvas? Is the cover attached to the frame? Or is it separate and I'll need to spread over the top? The cover and frame come separately and you would need to attach the canopy cover to the frame upon assembly. There are detailed instructions for this in the product manual on the item page. Is a side curtain kit available on the Pro Series-22599? Unfortunately, there are no walls available for this item. All of our Caravan brand items will have an option for walls. Is this easily put up by 1 person? Since I work alone this is very important. With any pop up canopy of this size, it is recommended that 2 people be available to erect the canopy. Happy with purchase of this canopy! Glad my wife found this on line. This canopy is sturdy and worth the money unlike some of those bargain cheapies out there at some retail outlets. Went up fairly easy and much larger than our previous ones. Sure offered more shade than others too. ProsFolded up for storage, fit into the included zippered storage bag and didn't take up much more room than the other 10x10 we had. Excellent head room and the vented roof made it much more wind resistant and allowed the heat to escape instead of building up underneath. ConsReally takes 4 people to set up. Fast service, great price and exactly as described. It's given our deck that gets direct sun some much needed shade and made it useable again. Pleased with the size of canopy. ProsSize, quality, easy of everything except the put up...small worry though... Strongly suggest using corner rope tie downs if not on hardtop. ConsA bit hard to put up (for our first few times anyway)...perhaps with practice we will get better! would still purchase regardless of a little challenge at first. This item is of good quality and very easy to set up and take down. Our new Shelter Logic canopy is great! We really liked everything about our purchase experience and the product itself, got here before it was scheduled and it is easy to put up and is easy to take down, thanks very much. Easy to order, great price, nice canopy. Would recommend.